The city of Oporto, as Porto was known in earlier times, was the export harbor from where barrels of Portuguese wine were shipped to London wine merchants beginning in the late 17th century to replace French Claret from Bordeaux, as England and France started warring in a series of extended regional conflicts. Claret, a red wine, was a beloved beverage of the upper classes of the Kingdom but a replacement was needed to deny France the considerable wine income, so English wine merchants boycotting Claret set up offices and warehouses in Oporto and Jerez, to purchase, age and prepare for shipping to the Kingdom local wines. That’s the reason that still most of the better Port merchants have English sounding names -- Sandeman, Warre, Churchill-Graham, Cockburn, Osborne, etc -- even though most of these companies have been in Oporto for hundreds of years. When the first shipments arrived to London, the merchants discovered that a number of the barrels had turned to vinegar during the long voyage on a rocking ship, so to avoid spoilage the shippers started to add alcohol “fortifying” the wine. Alcohol is a byproduct of fermentation where yeasts digest the sugar in the grape juice and convert it to alcohol. The fermentation stops when the alcoholic content of the wine reaches a certain level, usually around 18%. Adding alcohol in the form of brandy to the fermenting wine stops the fermentation, but also keeps much of the must’s sugar in place, which is why fortified wines have higher alcohol and are much sweeter than regular still wines. They also don’t spoil as readily and can have a much longer life. 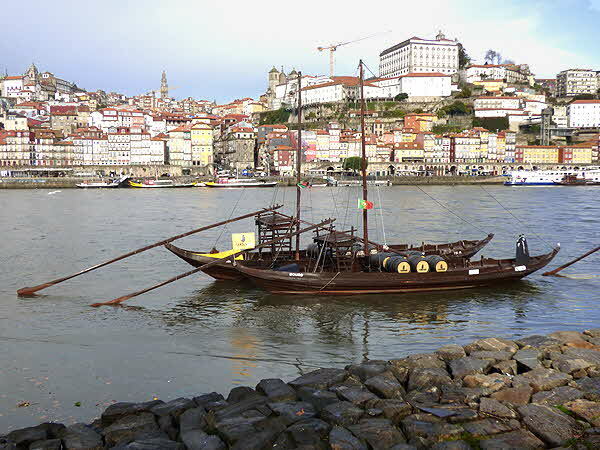 The name of the shipping point, Oporto, was simplified into Porto and the wines were labeled as “Port(o) Wines”€. Port producers declare their successful vintages. When a producer decides to “Declare a Vintage”, they mean that the wines produced in a given harvest possess the characteristics of an excellent Vintage Port. The regulatory body of the Port Association assesses a sample of the wine, ratifies the decision or not, and if they approve the wine can then be sold as Vintage Port. Not every producer declares a vintage every year. The decision to declare a Vintage or not lies with each and every individual port producer or shipper every year -- this is not a joint or trade-wide or regulatory-imposed decision. During my recent trip to Portugal, we picked up our river cruiser, Viking Hemmimg, in Porto and sailed up the Douro River to Salamanca, Spain. The Douro Valley reminds me of another river-created valley famous for its wines, the Mosel in Germany, where the best German Rieslings grapes have been growing and world-famous wines are created since the middle-ages. 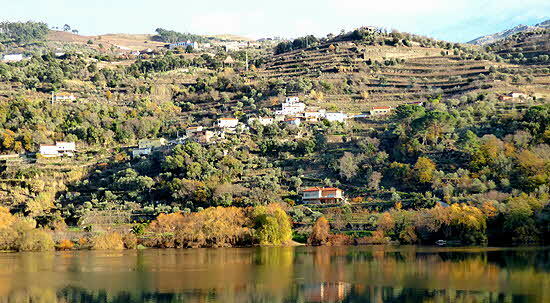 The Douro Valley is also known as Ribera del Duero within Spain, and the wines produced in both the Portuguese sector and the Spanish sector are considered some of the better wines produced in the Iberian Peninsula. 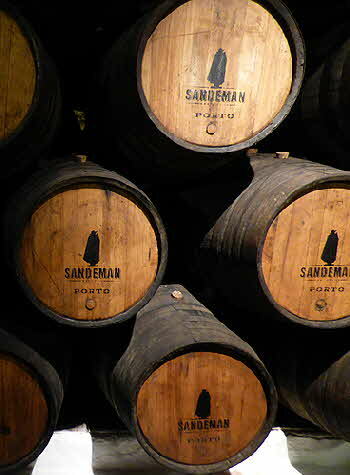 As part of the cruise program, we visited the House of Sandeman that has been, for more than two centuries, producing and ageing one of the world's most recognized Port wines. 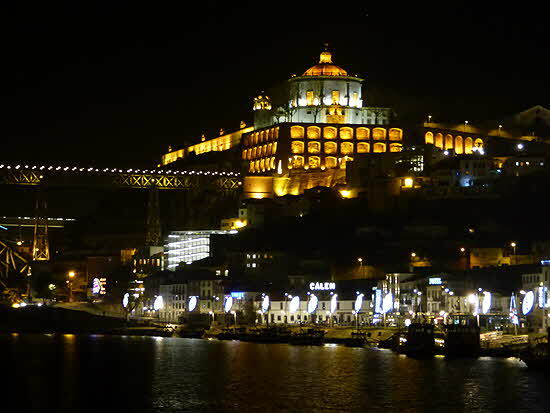 The cellars are situated next to the Douro River, in Vila Nova de Gaia, the sister-across-the-river city to Porto and they boast one of the best views over Porto. The location next to the river was advantageous because in earlier times, the harvest would be loaded on barges and transported from the valley to the winery. The company has also extensive holdings in Jerez de la Frontera, in southern Spain, producing Sherries. The 1928 Sandeman iconic logo of the company shows the silhouette of a nobleman dressed in a Portuguese student's black cape and wearing a wide Spanish hat; it connotes that the company has both Portuguese and Spanish holdings. Nowadays, Sandeman is owned and managed by Sogrape Vinhos, S.A., one of the largest Portuguese wine producers, with wineries through practically every Portuguese D.O. Port styles differ, each one with its own unique sweet fruity character. Some of the main styles include Tawny Port, the most recognizable, which is often described as having a nutty quality due to aging in oak barrels. Ruby Port is a younger wine that’s usually aged in vats and then bottled; it has not been aged as long as a tawny. White port is made from white grapes, and is usually drunk as an aperitif. Vintage Port is made with grapes from a single year and is quite harsh until it matures, aging in oak barrels. Late Bottled Vintage (LBV), is most times left unfiltered; it is wine from a single year’s production but bottled four to six years after the harvest. There is also Crusted Port, a rare style of port that is only made by a small number of producers and is characterized by total lack of filtration or fining; the wine forms a “crust” in the bottle, very unpleasant to the mouth, so it has to be carefully decanted before drinking. Made with a blend of wines from two or three vintages, this well-rounded style balances the best characteristics of a number of harvests. Non-vintage Ports that have been aged for a long time in wood pick up a lot of complex flavors and are a blend of wine from numerous harvests. These bottles are sold as 10, 20, and, if one is lucky to find one, 40 years old. The better ports have strong flavors and aromas of black fruits, figs, dates, fruitcake, prunes with hints of cinnamon, ginger, cloves, dark chocolate and nutmeg. Most have a very long, slightly salty finish. Warre’s Otima 10-Year Old Tawny; a vibrant, ruby-colored lighter port with flavors of brown sugar, marzipan, prunes and orange water with a nutty long finish and well structured tannins. This is a departure from a classic port but very enjoyable. We rated it at 91/100. The next was Graham’s 10 Year Tawny port, a viscous reddish-amber colored port with a nose of orange peel and marzipan and palate of brown sugar and maple syrup, dates, allspice, dried black fruit and dried red cherries. It is ready to drink when purchased. We rate it at 90/100. Another was Osborne’s 20 Years Old Port, a classic port. 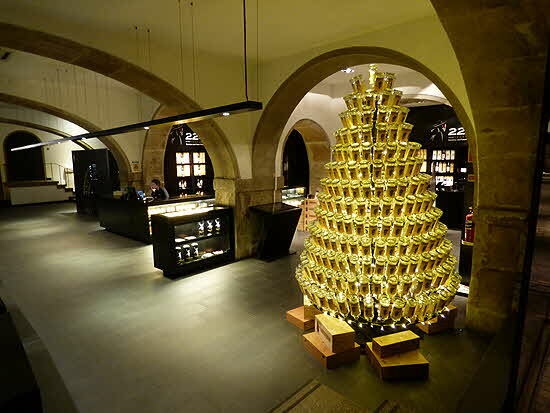 It had a palate of dried orange peel, apricot and chestnuts, cream and dried tropical fruit. Mocha, cocoa and spice accents lingered on the long finish. It was truly vibrant and complex. Again, ready to drink on purchase. We rated it at 91/100. Even though 1999 was a pretty poor year in the Douro Valley, Osborne “declared” the 1999 vintage and the wine we had I consider as a borderline one. Black cherry and chocolate flavors proliferated and it was clean and well made, but it just didn’t show much depth or complexity. We rate it at 88/100. Though Cockburn”s Special Reserve Porto is produced from grapes from a single vineyard, Quinta dos Canais, handpicked at the height of ripeness it is a rather inexpensive Port bottle that has no pretensions. It is fairly clean but has little depth. I rate it at 84/100..
We enjoyed very much our Douro River journey and the Port wines we had.